Do not miss a special offer from russiantranslator.pro! Get FREE Professional English-Russian Translation of your product description on Google Play! When you sell apps on Google Play your main concern is the same as about any other digital product: how to get more traffic and downloads. Organic search drives a large volume of traffic, therefore, to improve searchability of your app and to diversify the audience you may localize store listings – add professional SEO optimized translation of app’s title and description. You may say that Google provides automated machine translations of Store Listings but let’s be honest – machine translation is still far from perfect. When I see Google translated description on Play Market I often cannot make out what it is about. That being said, using a professional translation service for your description can lead to better search results and discoverability for worldwide users. 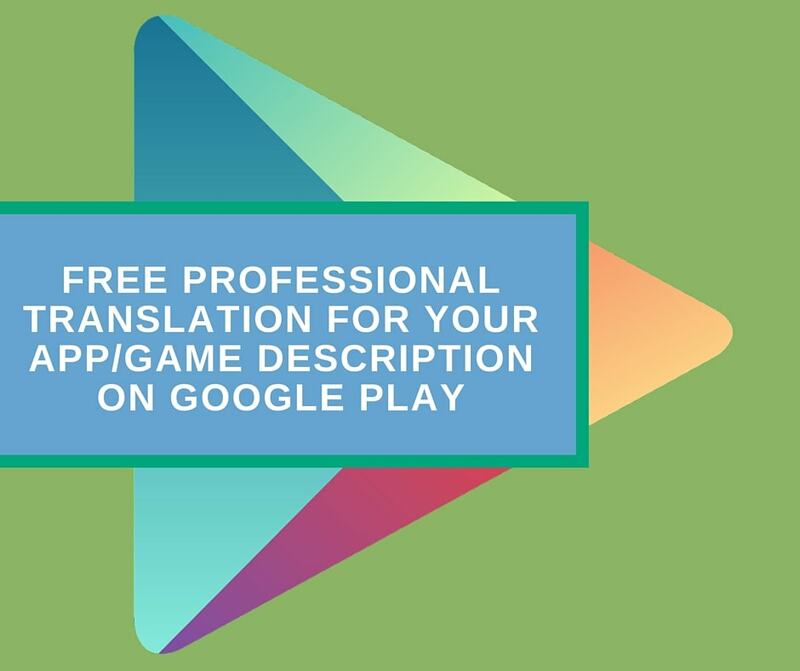 Get #FREE Professional English-Russian #Translation of your product description on #GooglePlay! As a rule, after adding a description in a new language (see how to do that below), you will get TWICE AS MUCH TRAFFIC and DOWNLOADS from relevant countries only due to the organic search. I am always looking for new possibilities for my translation business and I would like to help independent app/game developers and companies to conquer the Russian market. For this purpose, I offer FREE English-Russian translation of your game/app description on Play Market (one app per developer). This includes translation of a Title, and a Description not exceeding 300 words in total. How can you get free translation? Basically, you don’t need to pay anything! I only ask you to share this post on Facebook or Twitter. I will review your application and send the translated description when it is ready. I anticipate a large number of applications and I will try to answer all of the requests, but you should understand that this may take some time. Why expand to the Russian market? The Russian language is among top 10 languages in the world with over 160 million native speakers spoken in 16 countries. Let’s take a look at statistics on mobile games. The estimated number of Russian-speaking gamers equals to 46 million people! 56% of Russian gamers spend money on games that leads Russian to the 12th place on all platforms among top countries spending money for games (#10 on Google Play and #7 on Apple Store). Taking into account a significant size of the Russian market, you, as an app or game developer, may want to translate your app description (and maybe interface) into Russian. In addition, thanks to this special offer, you can take an advantage of FREE TRANSLATION of your app description by a professional translator. Why I offer my services for free? I know that many companies and independent developers underestimate the true value of product localization into foreign languages and/or think about translation as an expense, not as an investment. Translation services are not that expensive as you may think. In fact, you will earn more than you spend. Translation is a great investment – once you have your app translated, you will constantly attract new users from Russia and Russian-speaking countries. This special event is aimed to show that there are translators who can help you spread the word about your product onto the foreign markets. In addition, translation of 300 words does not take much time. I can afford to spend my time in exchange for your shares on social networks thus establishing a solid background for possible further cooperation. Potential to double your Russian audience. Potential to increase your earnings! When you see the results, we may discuss our further cooperation, e.g., translation of description/interface/content for the rest of your products. If for some reason you still don’t want to translate/localize your app content – it’s OK. You already “paid” for translation by sharing this info on social media. How to add translations for Store Listing pages? When you add translations of your app’s Store Listing page, users whose language preferences match the translation languages you’ve added will see your app’s translated version. Sign in to your Google Play Developer Console. On the left menu, click Store Listing. Under “Product Details,” click Manage translations > Add your own translation text. Near the top of the page, click Publish app (new apps) or Submit update (existing apps).